Artist Solomon Souza,22, spray-paints a portrait on the metal shutter of a closed storefront in Mahane Yehuda, one of Jerusalem's most popular outdoor markets, Feb. 24, 2016. A smell of spray paint drowns out the odor of fresh fish and meat as night falls on bustling Mahane Yehuda, a food market that is one of Jerusalem's most popular shopping sites. 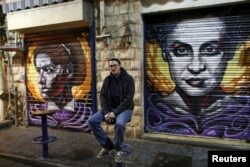 Artist Solomon Souza poses for a picture near portraits he spray-painted on metal shutters of closed storefronts in Mahane Yehuda, one of Jerusalem's most popular outdoor markets, Feb. 24, 2016. Souza's tools for this night's job are about a dozen spray-paint cans and his smart-phone. His glance alternated between the phone, depicting Lucy Aharish, a popular Arab-Israeli news anchor, and the three-meter-high (10 feet) version of her he was creating, one spray at a time. 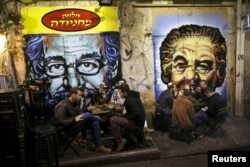 People dine near portraits of Albert Einstein (L) and former Israeli Prime Minister Golda Meir (R), spray-painted on metal shutters of closed storefronts in Mahane Yehuda, one of Jerusalem's most popular outdoor markets, Feb. 24, 2016.